Rule 261 has nothing to do with the fact it was manual block. 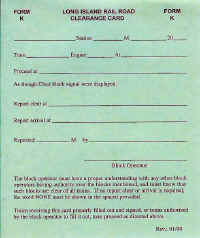 EM2000 wrote: Rule 261 has nothing to do with the fact it was manual block. True -- I remember they had manual block with 261 against the current of traffic on 1 and 2 between QUEENS and DIVIDE, and in all 4 East River Tunnels as far back as 1960 or earlier. I guess, strictly speaking, they had Rule 261 period, with automatic block with the current of traffic and manual block against. Anybody know when that dates from? Your dates are about right ExCon90. I read somewhere years ago that LIRR was installing reverse-signaling from Jamaica to Hicksville in the late 1950's. But I'm confused. I thought rule-261 meant wayside reverse-signals in both directions. So how can it also be manual-block if complete signaling exists? Depends on how it's wired. Some places have 261 in both directions if the need calls for it, say like Divide - Queens. However, on a lightly travelled branch such as the Far Rock or Long Beach. you can have 261 in it's primary direction, but manual block in the other direction. This is done as a cost cutting move for the rare occasion they do run against say like mid-day track work. It's only 1 train at a time within the block, but at least you can still run service. Its more equipment and inspection-wise to have it bi-directional/261 both ways, especially if crossings are involved. Rider Ave Crossing view W 5/1943 PD had two MBS (Manual Block Signal) signals at the limits of PD, the east showed the block to BLS BO (Bellport), the west showed the block to Y Block station. The signal on the right is the Manual Block Signal to "Y" Block station, and the 2 headed signal on the left is the west limit of PD. Back then MB (aka JJD) was controlled by PD. JJD were the initials of a past LIRR President (2003-2006), James J. Dermody, that controlled the siding at MS was named for him in the '90's. 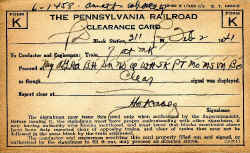 Card used in replacement of block signals in dark/manual block territory. PD controlled all the Block Limit Stations, BO, MO, PT, SK, WH, ND, SN, BH, AG, and MY (Montauk) until everything was transferred to Babylon, PD would issue "K" cards to allow passage by those BLS's without stopping, but reporting clear of the block station by radio to PD. This is the info I have thus far, it is not comprehensive and may have errors; as a work in progress. Comments welcome; as always. krispy wrote: Depends on how it's wired. Some places have 261 in both directions if the need calls for it, say like Divide - Queens. However, on a lightly travelled branch such as the Far Rock or Long Beach. you can have 261 in it's primary direction, but manual block in the other direction. This is done as a cost cutting move for the rare occasion they do run against say like mid-day track work. It's only 1 train at a time within the block, but at least you can still run service. Its more equipment and inspection-wise to have it bi-directional/261 both ways, especially if crossings are involved. That isn't Rule 261. That's Rule 251 with manual block provided for reverse direction movements (see the Far Rock and Long Beach lines). ExCon90 wrote: The neutral light on the bottom arm was used to display Clear Block. I think that in the linked photo I can just about make out the neutral light lit. I'll look at the original photo, but I do not believe the lower marker was lit. Jersey_Mike wrote: Was the line between PD and MS run under Rule 261 or was it manual block?. As of 1999 is was Manual Block from PD to MY (with switch/crossing) indicators. I don't think anything changed until they signalled the line to SK. LIRR Training Dept. track maps dated 01/2000, "Y" and MS were controlled by PD. LIRR Training Dept. remaining Block Limit Stations, WH, ND, SN, BH, AG, and MY(Montauk) are controlled by Babylon. It most certainly is rule 261 (which is a signal rule) in Krispy's statement. Automatic/Manual Block rules are just that, block rules. Signal rules and block rules are often confused, but are not the same. On both Far Rockaway and Long Beach branches, rules 501-509 (automatic block rules) are in effect traveling east on #2 track and west on #1 track. Rules 305-373 (manual block rules) are in effect traveling west on #2 and east on #1 - and rule 261 is still in effect both directions on either track regardless of which block rules are in effect. A lot of people think that Rule 251/261 is related to Manual and Automatic Block Rules. This is false because Rules 251/261 are strictly about Superiority. That is, whether a signal can be used to "swap" superiority between trains instead of a Train Order. If the operating rules between Far Rockaway and Valley do not require a Train Order to run East on 1 and West on 2, then Rule 261 is in effect-regardless of the Block Rules. If Rule 251 was in effect between Far Rockway and Valley, you would need a Train Order to run East on 1 or West on 2 or in lieu of a Train Order, a Special Instruction governing movements described above. Is it still 261 Manual Block Between Locust and oyster Bay? How about the Central Branch, is that 261 as well? 261, manual block between Locust and Oyster Bay, no ASC. 261 automatic block on Central Branch, no ASC.